Many c-suite executives are uncertain about the current state of their digital marketing. There is a lot of talk by marketers but many companies don’t have a clear roadmap of their digital marketing strategy and end-to-end marketing model. Part of the problem is that a department-focused marketing approach leads to a multitude of unaligned digital marketing initiatives. Lots of so called “activity” also creates disconnected data. But the bigger root problem is that many divisions focus too narrowly and don’t take the time to align their marketing initiatives. This article outlines the common pitfalls that executives see in their marketing strategies and how they should rethink their marketing model. This is a sample of a high-level view of a marketing ecosystem. It is an end-to-end view of the core digital marketing activities. Using a diagram like this you will be able to identify marketing gaps or bottlenecks and where you get your best bang for your buck. Which areas deliver disproportionate value? Many marketers are overwhelmed and feeling they are constantly on a treadmill. There’s never enough time to get stuff done and there’s increasing pressure for accountability. New technology, increasing competition, fickle customers plus integrating innovative practices are all major challenges. Trade publications have lots of stories about recent marketing failures and there is significant risk if a company misses the digital marketing mark. Silo thinking is a problem in many organizations. Marketing departments typically use multiple MarTech platforms that are often not linked (and are controlled by different teams). As a result, data is spread across numerous disparate systems. Without consolidated data many marketers have blind spots and only a vague notion of who their customers are (and their real behaviour). A recent Harvard Business Review article emphasized that “new disrupters know more about customers, because they have access to better data.” Established marketers need to adapt and get a wider perspective. Tunnel vision during planning can also be a nasty habit. Through our work as campaign operations experts with a number of Fortune 500 companies, we often find ourselves in meetings working with the various agency stakeholders on tactical initiatives. Sometimes the discussions can spiral into unnecessarily micro details. The danger is that planning time turns into marginal incrementalism that doesn’t factor in the bigger picture and thus won’t “move the needle” (i.e. get the results that the c-suite wants). So, is it surprising that the common complaint of many CEOs is that they don’t have “visibility” into how their marketing is supposed to work? They don’t want cloudy, vague uncertainty from various marketing reports. From their 30,000 foot view, CEO’s want to see a clear model that is interlinked. Marketing industry veteran Geoff Craig believes the key is a “systems thinking” approach. “Systems thinking” is a concept created by Geoff Craig, chief marketing officer of the Heart & Stroke Foundation and a former Unilever executive, that encourages marketers to think about the short-term and long-term impact of their actions on the entire ecosystem. In a digital world everything is hyper sensitive. Some actions may be positive for one stakeholder but negative for another. The key is that organizations need to understand their entire marketing ecosystem and be cognizant of the impact of every digital marketing activity. In 2017, a new style of data-driven marketing has evolved. It involves adopting lean marketing practices. In the engineering design world we call this going back to first principles and creating from there. It starts by identifying all the major components and broadening your perspective. The key is to constantly validate assumptions and gather key learnings. Note the model needs to be visual and practical. There are several ways that a marketing model can be divided. The traditional marketing model is in four parts: demand generation, acquisition, relationship building and retention. For today’s data-driven-marketing world, digital marketers like to talk in terms of what’s unknown versus known. Known is any marketing where you can identify and profile the individual plus message them directly. Email is the most powerful known marketing tactic because of its ability to drive response but also collect important data. But marketers can also learn from the anonymous customer through their unknown marketing (e.g. display ads, website visitors, etc.). Ideally, the known and unknown digital marketing efforts are linked so that data is shared and this leads to constant refinement on both sides. Tip: Starting with a blank piece of paper, divide the paper into Unknown and Known. List the scope of all your ATL digital activities and show what type of tracking you currently perform on them. Assess the lists you have and the quality of the profile and behavioral information. Are the lists and data consolidated in an actionable data mart? Describe your priority profiles. Tip: Draw a database symbol and highlight your current reports and analytics that you can access. To what level of targeting and profiling are you applying to your digital ATL programs? Any key learning? What are the best performing segments? How does the unknown profile compare to your known profiles? What email, other direct communications programs and interaction points currently exist? Draw the activities as loops. Tip: Starting with your database list the major types of campaigns, journeys, triggers. Highlight where your marketing team spends the most resources on these. Once the model is drawn, double-check to ensure that all the pieces are connected and highlight any areas where data may not be linked. Is there any opportunity to link anonymous data points with your known profiles? Do you have a clear understanding? Can you accomplish progressive profiling? 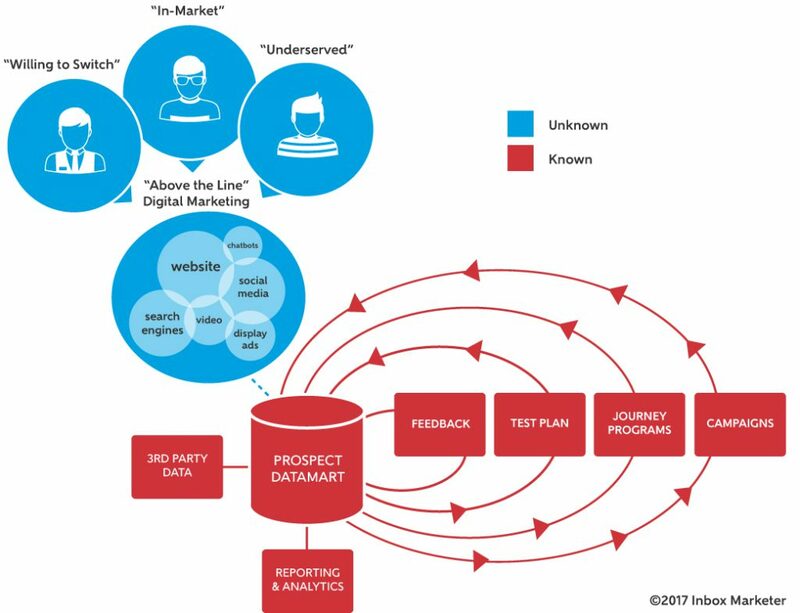 As discussed, marketing leaders first map the desired end-to-end flow and craft their strategy. Next comes the IT/Operations phase where the tech blueprint can be designed as an underlay/support model. Many marketers get handcuffed because their planning process is backwards and they lock-in technology solutions too early. A premature search for tech not only can waste a lot of time and distract teams but it also can limit your future capabilities. Beware of committing to major platform vendors if you don’t already have a plan. Identify what capabilities you really need. Bruce Biegel of the Winterberry Group believes that more companies are leaning toward “swappable tech.” It gives them flexibility. Open source solutions are configurable and cost efficient. Swappable tech is great for quick execution and can be upgraded later. From a strategic perspective, organizations that embrace marketing ecosystem planning find that they have better team buy-in and it also fosters deeper conversations with stakeholders. This ensures everyone is clear about your true marketing model. Clarity generates tighter execution and allows you to pinpoint “value-add” areas as well as specific areas to optimize. Ideally, marketing teams should take the time to meet stakeholders to review all the activity occurring and how programs are really working. Once your team has identified the key areas where value is added then IT/Operations can start talking about tech solutions. More balanced and aligned marketing decision making. As discussed, siloed strategies are not only inefficient but can also lead to tunnel vision which kills marketing’s credibility in the c-suite. A clear marketing model gets everyone on the same page. Ecosystem planning helps you to build a marketing machine that is a driver of business outcomes. It is a strategic approach that reinforces discipline and ensures that stakeholders embrace systems thinking. Geoff Linton is a founder of Inbox Marketer Corporation and a data driven marketing expert with more than 25 years of applied experience in both client and agency roles. He has worked in many industry sectors, including financial services, telecommunications, consumer packaged goods, technology, manufacturing, and professional service businesses. For the past 13 years at Inbox Marketer, Geoff has guided clients in digital messaging strategy and analytics. Geoff was previously an Associate Director for Air Miles (LoyaltyOne) and he was a Marketing Professor at Conestoga College of Applied Arts & Technology. Geoff holds both a P.Eng and MBA from Queen’s University in Canada.